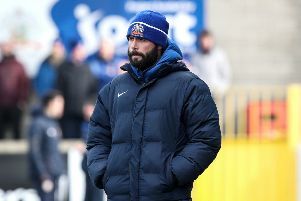 Glenavon’s surge towards Europe continued in sensational fashion as they crushed Cliftonville 5-0 at Mourneview Park on Easter Tuesday. The Lurgan Blues join the Reds on 60 points in joint third place with all to play for in the race for that prized third place and Europe. James Singleton, who bagged two goals on Saturday, was in the thick of the action early on as he charged into the box, keeper Peter Cherrie came out but did not gather the ball and Singleton’s pass to Ciaran Martyn was cleared. In a swift Cliftonville break Simon Kelly did well to block a firm shot from David McDaid. Glenavon began to get into their stride and after a promising break by Mark Patton came to nothing the home side took the lead on 12 minutes. It was a lovely goal, Rhys Marshall with a brilliant cross and Kevin Braniff planted a firm header into the top corner with Cherrie beaten. It was almost 2-0 a minute later as a deep free kick from Braniff was kept in play by Marshall and David Elebert guided his header inches wide. Then Bradley found a yard of space as the ball fell kindly to him in the box but he skied his half volley over the bar. The champions began to show their teeth as they pressed hard for the equaliser but the pairing of David Elebert and Simon Kelly were solid blocking shots and winning the aerial battle to keep the home side ahead. Towards the end of the first half Glenavon carved out two more chances in quick succession. First Singleton just failed to get his left boot onto a corner from Patton and then Martyn skied a shot over the bar after a mistake by Bonner. On 43 minutes Cliftonville had their best chance of the half as Joe Gormley got in behind the home defence but McGrath made a superb save to deny the league’s leading goalscorer. Five minutes into the second half and Braniff produced a moment of magic. Marshall did well to win possession and poke the ball to the Glenavon striker, he nipped past Marc Smyth and cut inside before drilling a hard low shot past Cherrie. A brilliant finish from the club’s leading goalscorer with 18 goals this season. On 61 minutes Patton made a surging run down the left flank and crossed into the box for Martyn, his header seemed to be heading into the net by Cherrie reached out to make a brilliant save. Two minutes later and Cherrie was beaten as Bradley chased a ball which deflected off Braniff into the box and just got a touch to take the ball past the Reds keeper and put the home side firmly in control. The home fans were in dreamland on 73 minutes as the Lurgan Blues made it 4-0. A corner from Braniff was met by Elebert, the ball was not cleared and it fell perfectly for the central defender to hammer back into the net. With three minutes to go Patton sealed Glenavon’s biggest ever win over Cliftonville in the Premier League as he scooped the ball home from close range.